At Wise Owl we do our ASP.NET website development using Visual Studio 2010, but there are a few settings we always change when we install it. I thought it might be useful to list these in one place! Start-up options When I load Visual Studio I don't want to see a Microsoft news group, but I do want to see the project I've just been working on. Changing default format for pages I spend most of my time editing web pages in HTML view, so it's annoying that they open by default in design view. Quotation marks By default, Visual Studio doesn't surround attributes with quotation marks in HTML view, even though it's so obviously what you would want. Navigation keys The F12 key takes you to the definition of a word, but we find it useful for the SHIFT + F12 key to take you back. All of the changes to default settings in this blog use the Tools -> Options dialog box. 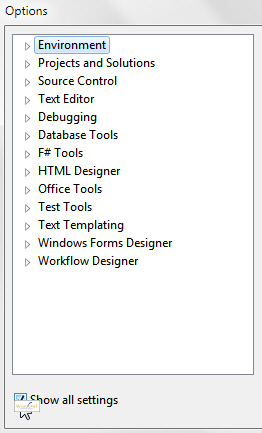 Even though the diagrams shown are for Visual Studio 2010, the menu options and dialog boxes are similar for Visual Studio 2005 and 2008.